Samba-Enredo: Samba with descriptive lyrics. The songwriters have to be affiliated to an “Escola de Samba” (school of samba) and it is composed aiming to be performed at the Carnival feasts, during the Carnival parade. They are usually played at faster tempos, with little harmonic instrumentation (usually just an acoustic guitar and a Cavaquinho), so all the attention is focused on the strong percussion group of instruments (here in Brazil, called "Bateria") and on the samba's singer (“puxador”). Samba-Canção: Samba running slow tempo with usually sentimental themes and lyrics, with a simplified Samba's rhythmic cells. It is considered the "Brazilian Blues". Partido-Alto (Samba de Roda): Samba well cadenced at medium tempos. This form presents a refrain that is repeated and improvised stanzas. In Bahia, it is called Samba de Roda. Batucada: Samba which uses only percussion instruments. The guiding instrument is usually the whistle. Samba de Breque: It is the Party High with brakes. Usually something is spoken and, then, the music returns. An exponent of this genre is Moreira da Silva. Choro: Born in Rio de Janeiro, Choro emerged in the late nineteenth century (1870) as a Brazilian way of playing European music (Waltzes and Polkas). The Choro has the Rondo form, in other words, it is divided into 3 parts: A-B-A-C-A with part C usually modulating to the homonymy, or for its IV or V degrees of tonality. Choro, in the 30s and 40s, has the instrumental virtuosity and improvisation as characteristic, usually in fast tempos. It is also considered a Brazilian parallel to the American Jazz, due to the technical requirement of the instrumentalist. Some more daring ones venture in the field of improvisation. 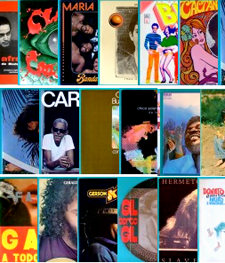 Some artists who represent Samba: Noel Rosa, Dorival Caymmi, Donga, Moreira da Silva, Adoniram Barbosa, Paulo Vanzolini, Ataulfo Alves, Dona Ivone Lara, Paulinho da Viola, Candeia, Walter Alfaiate, Grupo Fundo de Quintal, Elton Medeiros, Beth Carvalho, Nelson Sargento, Leci Brandao, Zé Keti, Cartola, Herivelto Martins, Ary Barroso, Nelson Cavaquinho, Geraldo Pereira, Martinho da Vila, Assis Valente, Novos Baianos, Caetano Veloso, Gilberto Gil, Chico Buarque, Joyce, João Bosco, among others / Choro: Pixinguinha, Jacob do Bandolim, Waldir Azevedo, Ernesto Nazareth, Zequinha de Abreu, Altamiro Carrilho, Garôto, Dilermando Reis etc.